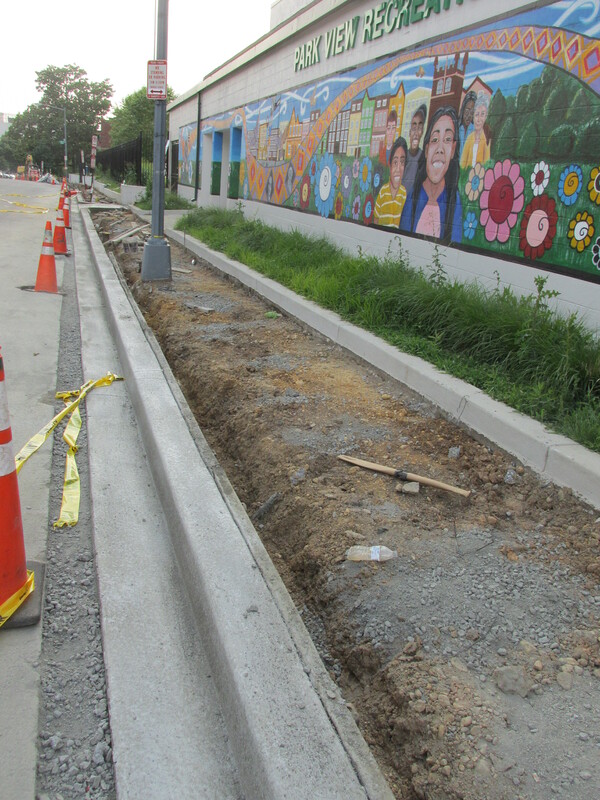 DDOT Replacing Sidewalks on Otis Place, Fails to Consider Street Trees | Park View, D.C.
State of sidewalk work on Otis Place, evening of June 30, 2015. Readers of this blog will now that I’ve been a strong advocate for trees and improved streetscapes for several years. Sadly, despite walking the streets of the neighborhood with the Urban Forestry Administration and getting a good sense of which treeless streets could support street trees, I discovered at the beginning of the week that DDOT began a project to replace the sidewalk on the north side of Otis Place — along the Park View Recreation Center — exactly as they found it. In short, the treeless block of Otis between Warder Street and 6th Street will remain treeless. I contend that the one way street is wide enough to accommodate a slight narrowing to make room for trees. Additionally, no parking is allowed on the north side during school hours. Upon learning of the sidewalk project which also included a complete replacement of the curb and some of the road, I contacted DDOT immediately and was told by the end of June 30th by a DDOT representative that “I confirmed with the team that the work can stop after today and investigate the cost and feasibility of adding tree boxes.” This sounded like good news, as at that stage only half of the new curbing had been installed and none of the sidewalk had been poured. Sadly, DDOT did not honor their word. The following day the rest of the curbs were poured along with most of the sidewalks. To my knowledge, there was no investigation regarding cost or feasibility. Furthermore, the stretch of street where this occurred contains no storm water catch basins. This should have been the easiest win/win for both DDOT and the community. State of sidewalk work on Otis Place, evening of July 1, 2015. I feel strongly that it is critical that the long term goals of the community not be ignored when real opportunities present themselves, such as this sidewalk on Otis Place. I also feel it is important that the voice of the community — your voices — not be silenced because DDOT and others choose to work around their ANCs who I can assure you receive many, many emails with suggestions, concerns, and ideas on how to make our neighborhoods great. Moving forward, I have written and will introduce a resolution at the July 8th meeting of ANC1A urging that the ANC law be amended such that DDOT be required to provide notice when significant streetscape & sidewalk replacement projects are undertaken. DDOT already does this for curb cuts, public space permits, and handicapped parking requests. Significant streetscape work should be no different. I will continue to press DDOT on this issue, both specifically on Otis and more broadly on our other treeless streets. As for Otis Place, I’ve reached out to the Mayor’s Office, Councilmember Nadeau, and others to bring light to this epic fail. This entry was posted on July 2, 2015 at 7:01 am and is filed under Streets and Trees, streetscape. You can subscribe via RSS 2.0 feed to this post's comments. Have you reached out to Tommy Wells? 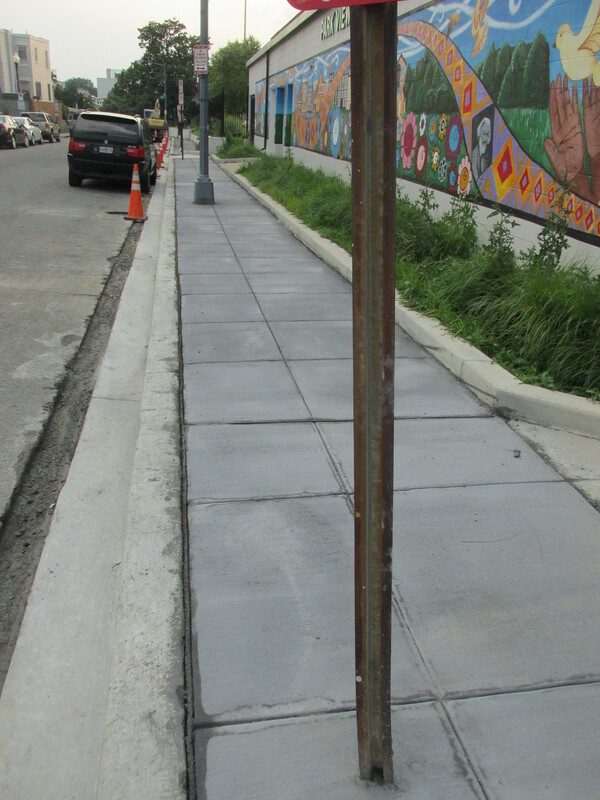 There is a natural alignment with streetscape work under DDOT and the efforts to reduce impervious surfaces under his agency (in collaboration with DC Water). Not a great solution for this immediate concern, but long term, I think it is a great opportunity to expand the potential funding pool of such projects that have immense benefits for our neighborhoods.